Historic summit closes in Bolivia, while government grapples with it's global leadership on environmental issues. Bolivia's social spending is largely due to destructive exploitation projects. A problem faced by many countries, Bolivia has an answer, it's called climate debt. JESSE FREESTON, PRODUCER, TRNN: Last week, the Bolivian city of Cochabamba and the country’s president, Evo Morales, played host to the World Peoples Conference on Climate Change and the Rights of Mother Earth. The conference sought to distinguish itself from United Nations conferences for giving a greater voice to civil society and expanding the conversation beyond just greenhouse gas reduction. The Real News spoke to Jean Friedman-Rudovsky, a Bolivia-based freelance journalist who recently returned from the conference. JEAN FRIEDMAN-RUDOVSKY, FREELANCE JOURNALIST: The official count was that there were 35,000 participants, 142 countries represented, and 47 of those countries sent official delegations. EVO MORALES, BOLIVIAN PRESIDENT (SUBTITLED TRANSLATION): We’re here today because the so-called developed countries didn’t fulfill their obligation to commit to substantial reductions in greenhouse gases in Copenhagen. If these countries had respected the Kyoto protocol and had agreed to substantially reduce their emissions inside their own borders, this conference wouldn’t have been necessary. FRIEDMAN-RUDOVSKY: There were so many proposals and ideas that were sort of popping up all over the place, I mean, everything from, you know, an international criminal court on climate change to a global referendum, to pushing this idea of climate reparations or climate debt. So I think the message that this summit sent was: if you guys aren’t going to be able to do this, then we need to take matters into our own hands, that, you know, people from all over the global south are going to get together and talk about their experiences, talk about solutions, and try to push that message to be incorporated into the next summit of world leaders. MORALES: If in the end they don’t listen, how will we organize and empower ourselves in society, in the workplace, all over the world, to force the developed countries to respect the conclusions of the world’s social movements? FREESTON: As the summit wrapped up in Cochabamba, Bolivia’s finance minister, Luis Arce, was in Washington, DC, giving a presentation on Bolivia’s economic alternative to neoliberalism and its results in the four years since Morales took power. LUIS ARCE, BOLIVIAN FINANCE MINISTER: GDP per capita, it means when we received the government in 2005, we received aid with US$1,010 per boliviano. And now we have $1,683, a growth rate of more than 60 percent in four years. We have now the highest growth rate in the region—and when I’m talking the region, it means from Alaska to Argentina. FRIEDMAN-RUDOVSKY: Over the past year and a half, you have global economic recession. And the fact is, in Bolivia things have not gotten worse over the past few years, which is really saying something. I mean, it’s South America’s poorest nation, but as you know, the economy is growing. FREESTON: As for how such success was arrived at, Arce primarily credited the nationalization of the oil and gas industry for increasing government revenues, revenues which were then directed towards infrastructure, key industries, and social programs. ARCE: We have resources, we have hydrocarbons, mining, electricity, and environmental resources that we can use to [inaudible] at the new Bolivia, the new Bolivia who will invest in industry, manufacturing, tourism, agriculture, and so on. So who can do this job for us? Of course the private sector cannot do that, because the private sector is seeking other things, its profits and so on. The only actor that could do it is of course the state. FREESTON: Some are suggesting that Bolivia’s extraction economy is creating a contradiction. FRIEDMAN-RUDOVSKY: Evo Morales, who’s really leading this world movement to protect the rights of Mother Earth, yet in his own country there is still—this extractive industry is the base. The problem is they can’t just cut off all extractive industries right now. The economy would crash. People would starve. People would die. FREESTON: The Real News asked the minister about this apparent contradiction. ARCE: The current law, you know, has parameters for the mining and hydrocarbon exploitation, so we don’t have problems with that. We have already take care of the natural resources and the environmental. No problem at all. There’s no contradiction at all. FREESTON: But even during the conference in Cochabamba, a series of direct actions were taken by community groups around the San Cristóbal silver and zinc mine in the neighboring department of Potosí. They claim that their water supply is being depleted by the mine, which is run by the Japan-based Sumitomo Corporation. DEMONSTRATOR: We demand that the company preserve the environment, not contaminate it. FREESTON: They want the company to pay for the 600 litres of water per second that it uses, which it currently gets for free under an agreement with the government that preceded Morales. Actions taken by protesters included blocking all railroad and road shipments for almost two weeks and burning down a company office building. The protesters want their water resources replenished, as well as funding for electrical infrastructure projects. The blockade has since been lifted, but the group pledged to take action again if they see no progress in the next month. At the UN climate summit in Copenhagen in December, Danish authorities chose to repress street protests, where almost 1,000 people were arrested, most of which after being penned in for hours by police. In contrast, the Morales government did not attack or arrest the protesters in Potosí. 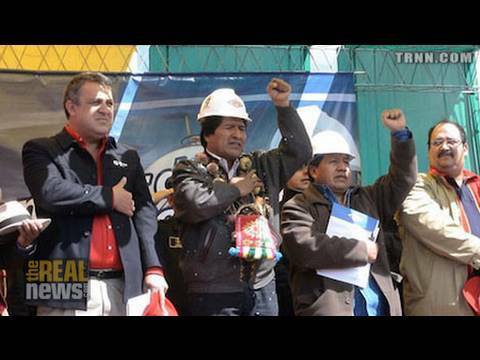 Nonetheless, the actions did bring Bolivia’s resource dilemma to the forefront. In an interview with Democracy Now! President Morales acknowledged it as a challenge. MORALES (VOICEOVER TRANSLATION): We need in-depth studies on this. If we want to defend Mother Earth and the rights of Mother Earth, any project for industrializing natural resources has to respect the regeneration of biocapabilities. FREESTON: But he had harsh words for the organizations who chastise his government for supporting extraction and infrastructure projects. MORALES: Those foundations, NGOs, said Amazon no oil. So they’re telling me that I should shut down oil wells and gas wells. So what is Bolivia going to live off of? So let’s be realistic. And they tell me don’t build roads. And another one says don’t build dams. The day before yesterday, when I was just back here, I announced that we’re going to build a road from [inaudible] to a place near here. That is the most widely applauded project by the grassroots people because the people who—need to be able to have access. If we look just out here, in Alto, every day they’re asking for small-scale dams. So NGOs and some leaders say no when they’re not interpreting the needs of their grassroots. That is the truth. FREESTON: Bolivia’s central proposal for overcoming the reliance on extraction is the idea of climate debt. At the Copenhagen Summit in December, Bolivian climate negotiator and ambassador to Switzerland Angélica Navarro explained the concept of climate debt. ANGÉLICA NAVARRO, BOLIVIAN CLIMATE CHANGE NEGOTIATOR: Therefore Bolivia consider that it’s developed countries that owe a climate debt to developing countries. This debt has to be paid to us. And we’re mentioning that this debt has to be twofold. The first one is that they have to repay regarding their own emissions. They have to free space for developing countries to carry out a sustainable development, because we don’t want to develop in the irresponsible way they have done. FRIEDMAN-RUDOVSKY: Making, you know, the industrialized world responsible for helping or aiding countries in the developed world, to not just continue resource extraction but to really jump to clean energy. And so I think they’re really trying to push that idea, trying to get financial or technical resources to be able to move on a cleaner path themselves. FREESTON: This tension that comes with extraction-based development isn’t exclusive to Bolivia. Ecuador recently became the only country in the world to include the rights of nature in its constitution. But like Bolivia, the Ecuadoran government also funds its social programs with extraction revenue. President Rafael Correa has suggested another way that developing countries with resources could overcome this problem. RAFAEL CORREA, ECUADORAN PRESIDENT (SUBTITLED TRANSLATION): Perhaps the audience isn’t aware of the Yasuní-ITT initiative. At more than 900 million barrels of oil, it’s the largest reserve in Ecuador. But it’s in a very ecologically sensitive area, Yasuní National Park. We’ve proposed to the world that we leave this oil underground, thereby avoiding the emission of more than 400 million tons of CO2, whose market value would be around $5 billion in carbon credits. We’re asking for $3.5 billion—half the expected profits from these reserves. The one making the major sacrifice here is Ecuador. Financially, our interest lies in extracting the oil. We want to work together to avoid the acceleration of climate change, at least, a climate change that wasn’t caused by the poor countries but by the rich countries. So we are demanding co-responsibility with the rest of the world. If this doesn’t happen, we will have to extract the oil. FREESTON: Industrialized governments have yet to show consideration to these kinds of ideas. In fact, the Obama administration actually cut some aid to Bolivia and Ecuador following their rejection of the Copenhagen Accord. US climate negotiator Todd Stern told The Washington Post that "… the US is going to use its funds to go to countries that have indicated an interest to be part of the [Copenhagen] Accord." In the meantime, Minister Arce confirmed that Bolivia has plans to expand its extractive industries in order to finance its many goals, such as food self-sufficiency and extreme-poverty eradication.